1. As per SA 240, the primary responsibility of detection and prevention of fraud is upon with the charge of governance and management. An auditor conducting an audit is responsible for to check that the financial statement taken as whole are free from material statement, whether caused by fraud or error. 2. It is important to know that the liability of the auditor is for failure to detect is only arise when he is not applying reasonable care and skill. 3. When a transaction has been mis-recorded either wholly or partially it is called as a error of commission. Four types are (i) Error in posting (ii) Errors in casting (iii) Errors in carry forward (iv) Errors occurring during extraction of balances. 4. Conditions which increasing frauds and errors are (i) Weakness in the design of internal control system and non compliance of control procedure (ii) Doubts about the competence of the management (iii) Unusual pressures within the entity (iv) Unusual Transactions (v) Problems in obtaining sufficient and appropriate evidences. 5. As per SA 560, Subsequent events are those events which occur between the date of financial statement and the date of the auditor’s report. The auditor should consider the effect of subsequent event on the financial statements and on the auditor’s report. The auditor should also obtain sufficient and appropriate evidences that all subsequent events are disclosed or its effect is disclosed in financial statement. 6. The auditor should possess specific knowledge of accountancy, auditing, taxation etc. He also have a knowledge of general principles of law. He also have some personal qualities such as tact, caution, firmness, judgement, commonsense, reliability, trust etc. 7. As per SA 700, General purpose financial statements are prepared in accordance with a general purpose framework. It normally includes a balance sheet, profit and loss, a cash flow statement and notes to the accounting. Such financial statement are prepared and presented at least annually and are useful for general purpose. 8. As per AS 1, The going concern concept describe that the entity will continue for the foreseeable future. Accounts are prepared on this concept except if there are indications that going concern is not good. No specific disclosure is required to be made if it is followed but if the same is not followed then specific disclosure is made regarding it. 13. Engagements standards issued by AASB are (i) Standards on Auditing (ii) Standards on Review Engagements (iii) Standard in Assurance Engagements (iv) Standard on related services. 14. As per AS 2, When determining cost of inventories it is appropriate to exclude selling and distribution cost and recognize them in the period in which they are incurred. 15. As per AS 26, Computer software is an integral part of the related hardware so it is treated as fixed asset. 16. A transactions conducted on such terms and conditions as between willing buyer and willing seller who are unrelated and are acting independently of each other and pursuing their own best interests is called Arm’s length transaction. – The auditor’s view about significant qualitative aspects of Accounting Policies, Accounting Estimates and Financial Statement Disclosure. – Significant difficulties find during the audit. 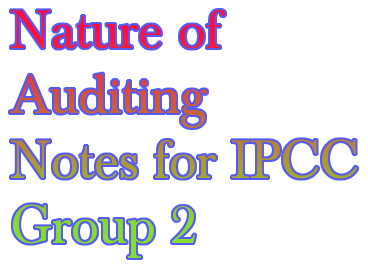 – Written representations that the auditor is requesting. – The size and complexity of the entity. – The nature of the audit procedure to be performed. – The indentified risks of material misstatements. – The significance of audit evidence obtained. – The audit methodology and tools used. – In case of test of control, that control are more effective then they actually are or in case of test of details that a material misstatement does not exist when in fact it does. – In case of test of control, the controls are less effective then they actually are or in case of test of details, that a material misstatement exist when in fact it does not. 20. As per SA 710, In respect of corresponding figures, the auditor shall determine whether the financial statements include the comparative information required by the applicable financial reporting framework and whether such information is appropriately classified. 21. Self revealing errors are the errors the existence of which becomes apparent in the process of compilation of the accounts. Its four example are (i) Omission to post a part of a journal entry to the ledger (ii) Wrong totalling of the purchase register (iii) A failure to record in cash book (iv) A mistake in recording amount from x in account of y. – Investigations by regulatory organizations and government departments. – Payments for unspecified services or loan to consultants, related parties, employees. – Sales commissions or agent’s fees that appear excessive in relation to those ordinarily paid by the entity. – Purchasing at prices below or above market price. – Unusual payment in cash. – Unusual payments towards legal and retainership fees. – Unusual transactions with companies registered in tax havens. – Payments for goods or services made other than to the country from which the goods or services originated. – Payments without proper exchange control documentations. 23. As per SA 530, Audit sampling is application of audit procedures to less than 100% of items within a populations of audit relevance such that all sampling units have a chance of selection in order to provide the auditor with a base on which to draw conclusion about the entire population. 24. The statements are issued with a view to securing compliance by members on matters which are critical for proper discharge of their functions as per the opinion of the council. So statements are mandatory to follow. guidance notes are their which is mandatory to follow to the auditors while discharging attest functions. – Whether new commitments, borrowings or guarantees have been entered. – Whether sales or acquisitions of assets have been occurred. – Whether there have been increases in capital or issued new debt instruments. – Whether any assets have been destroyed e.g. by fire of flood. – Whether there have been any developments regarding contingencies. – Whether any unusual accounting adjustments have been made. – Whether any events have been occurred that are relevant to the measurements of provisions. – Discuss the matter with government. – Re evaluate the integrity of management. – Take appropriate actions, including determining the possible effect on the opinion in the auditor’s report. – Intention of management to liquidate the entity or to cease the operations. – Loss of key management without replacement. – Loss of major market, key customer, franchise, license, or principle supplier. – Shortages of important supplies. – Emergence of highly successful competitor. 29. As per SA 200, Professional scepticism is an attitude that includes a questioning mind, being alert to conditions which may indicate possible misstatement due to fraud or error. The above notes are useful to students for revision of chapter 1 of auditing. Last statements which are highlighted with red colour are very important so must go through it. All the best for your exam.